I write about why casual clothing is complicated, so much more so that suits and ties, in my latest column on We Are The Market, which you can read here. There is also now a nice homepage with links to all my previous articles, including the sockless debate and buying the perfect casual jacket. The length of these columns makes them slightly more thought-provoking than instructional, but I hope you find them interesting. You can follow the discussion on How to wear T-shirts, jeans and much else by entering your email address in the box below. You will then receive an email every time a new comment is added. These will also contain a link to a page where you can stop the alerts, and remove all of your related data from the site. Interesting post on casual wear. For me one of the reasons casual wear can be more difficult is because your body is more in display (than in a suit) and therefore you need to know what flatters and what does not. 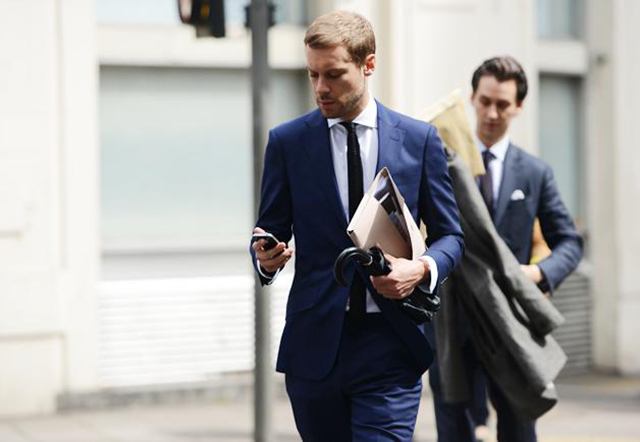 A suit cut to your shape will always flatter — possibly more difficult to work out with jeans and t-shirts. I’ve got a question for you though, and I hope it is sufficiently on topic: Do you like white chinos and if so, how do you think someone can ‘pull it off’? They create quite a stark contrast to anything you wear with them, and I find a lot of people are reluctant to wear them because they are a bit ‘out there’. What are your thoughts? Thanks Mark. There’s no reason your body should be on display more with casual wear, given that many people just wear shirts for ‘dress wear’ these days anyway. Smart knitwear is the way forward there, with every weight you could possible want available. Naturally, given my recent collaboration, I would recommend Smedley. White trousers have negative connotations, certainly. I think the key is to keep everything else simple – blue shirt, brown/tan shoes, grey/navy knitwear maybe. It’s the same as other contrasting items, such as white shoes or pale jackets. Hi Simon, just a question out of the blue! What do you think about suspenders these days, is it okey to use, or do you have to cover them up with a blazer or something? I’d only wear them for a practical reason – for high-waisted trousers that were cut with suspenders in mind. That’s exactly my thought, have seen a lot of trousers lately with suspenders with selling pretty good here in Sweden, thanks for the quick answer! To Marks point about the body being more on display, I think this is true, when it comes down to just T-shirt and Jeans. As your body is more on display in a T-shirt, I believe the fitting of the T-shirt is important. There are different styles for T-shirt fit, however the most stylish and safest choice would be following many of the same guidelines as for dress shirt fitting. And the single most important measure to be aware of is how the T-shirt fits your shoulders. Are the shoulder seams at your shoulder tip? Secondly the T-shirt should fit nicely around your chest without being to tight. For a T-shirt that then fits your upper body, it will be very important that it is not tight on the waist or too short (which often happens). On a short sleeved T-shirt most men (at least those of us working in an office) would also benefit from sleeves being relatively tight to the overarm. If you would still feel a bit naked in a plain T-shirt, you should consider one with a few extra details as a chest pocket, a discrete embroidery/print and a nice neckline. White trousers have negative connotations, certainly?? ?